← Dog Training Myths… BUSTED! This weekend I sacrificed a day at Sutton Weaves UKA to work on my APDT assignments, a good decision as it needs to be done soon, plus I had Dig It’s Club Competition on Friday night and Can You Dig It today. 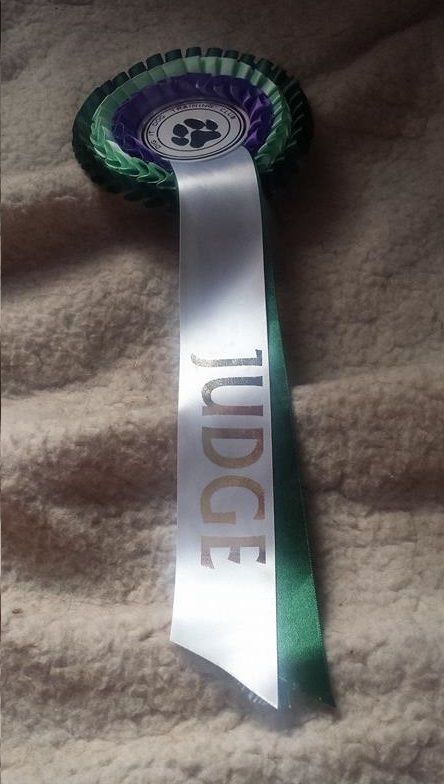 I offered to Judge as they were struggling to find people and got off lightly, only needing to do Intermediate and Advanced Agility, which ran the same course. I was judging in the afternoon so we started the morning straight away with Intermediate Jumping. I had plenty of time to get Guinness warmed up and we were the first to the ring, Guinness tugging nicely. It turned out there were only three of us entered in Large Intermediate so I had no worries with queuing. Into the ring with some great tugging and I unclipped his lead and he kept tugging. We’re struggling with letting go of the toy once he is tugging at the moment, which makes a change! I love Guinness, when we “solve” one “problem” he always throws something else at me. Never a dull moment! He went into a down and release the toy and then I moved into the start position I wanted and called him to in between my feet. My perfect start line! (Although a quicker drop of the toy would be better). It was a nice simple Jumping course with only 8 jumps and some tight handling as well as blasty sections. The first 3 jumps to the tunnel were a tricky spacing and angle and Guinness bombed over number 3 and knocked the wing and jump flying. Unfortunately we had to go back over that jump twice more so I just aimed Guinness at the pole and he found his way in between the wings. What I should have done is popped Guinness in a down, stood the jump back up and then carried on quickly towards the finish, rather than aiming him at a skew-whiff wing and pole just for the sake of continuing the course. Onto the weaves and Guinness missed him entry a few times and then popped out at number 11. He is turning and looking towards me at 11 and not finding the final gap! 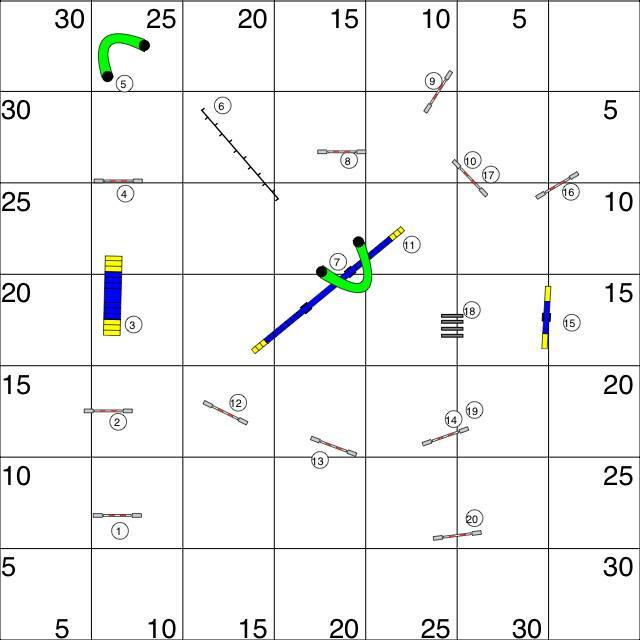 Ahh, more training needed on 14+ poles! We had some nice distance pivot work and a tight front cross on a 180 though. And let’s not forget about our fabulous wait! Our second run went in a similar fashion, same weave issue. 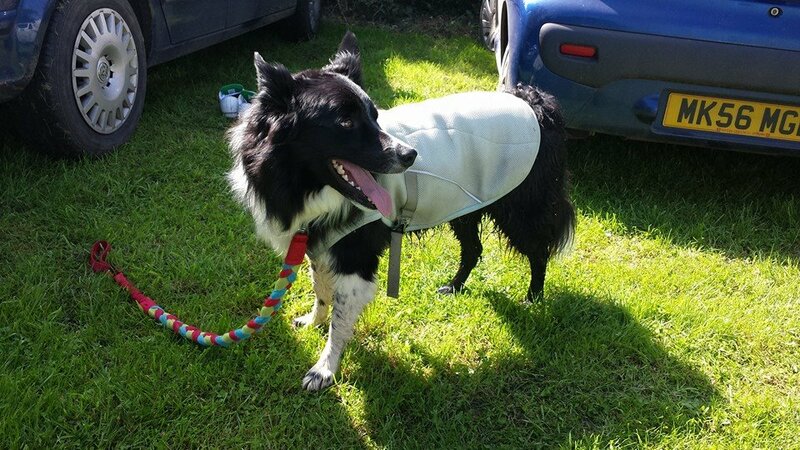 At this point the sun was really beating down and I was very pleased that I had recently bought a second hand cool coat, it was a life safer today. We jumped into Beginners Agility for a couple of NFC runs. The queue was fairly small again and Guinness was happily tugging once we were inside the ring and then I unclipped his lead and he continued tugging. For one run I held his collar, revved him up and then asked for a down as I let go. Nailed it! This is our back up for when he wont tug or choose to come around my legs to a down. He had a fast run, avoiding contacts with some wing wraps and straight line blasts. (I’ve stepped away from contacts completely while we work more on our foundation behaviours at home such as nose touch and back foot target). Time for brunch and to get ready for judging. I loved my course on paper and it set out in real life quite nicely, taking a little bit of small tweaking before I was finally happy. We got cracking and quickly moved through the heights. With low entries there were only a handful of clears, the biggest problem being 17-18, avoiding the dog walk. However I received some nice comments and I think the course was suitable for the level. 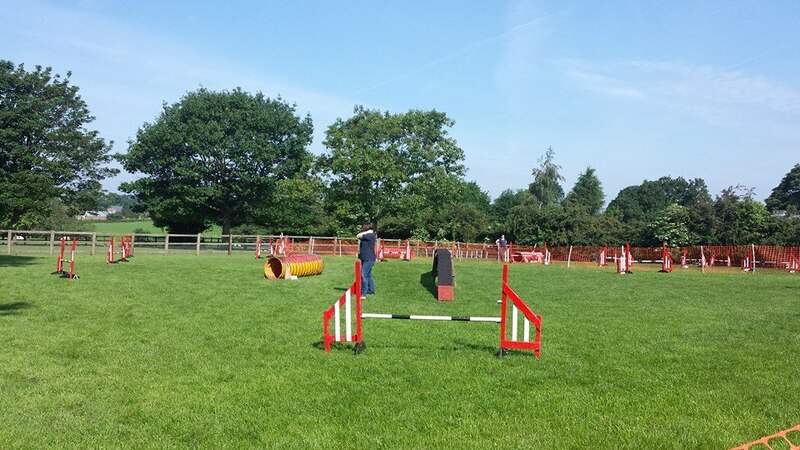 I was due to follow on with Steeplechase for Medium-Small dogs, and I was looking forward to laying out a fun steeplechase course, however as we were heading for an early finish and a lot of people had gone home we decided to do all heights in Ring 2. Hurrah I was finished! I grabbed Guinness and ran him around my agility course (very naughty as we did the contacts) and met the same issue at the weaves. We managed all 12 on a third attempt and the course ran smoothly. We struggled a little with the flick flack and I hung back at 14, sending him from behind and over the wing and then the rest ran well. Into Steeplechase and Guinness wasn’t quite right, I think he was hot and still feeling a little rushed. I should have taken him for a walk and a real warm up before running him around my agility course. He ran off at the start line and I eventually got him back. I don’t think the Judge marked a refusal and I left him for a nice long wait. We set off fast around a speedy steeplechase course, knocked a pole or two and then were caught out, Guinness went off over a jump to the side instead of heading to the tunnel. A bit of deja vu from Anglesey again, this time Guinness peeling off to the side away from me rather than coming across me to turn. Eliminations galore! Oh well, what a fun show. What great waits!! Argh. Why can’t we have that confidence and attitude at other shows. I feel like we are taking a step in the right direction however. I’ve been doing lot of games with Guinness from Absolute Dogs training and it is helping, plus the work we’ve been doing with collar grabs is also making the whole start line experience much better. Next show is Oswestry in a few weeks! Eek!